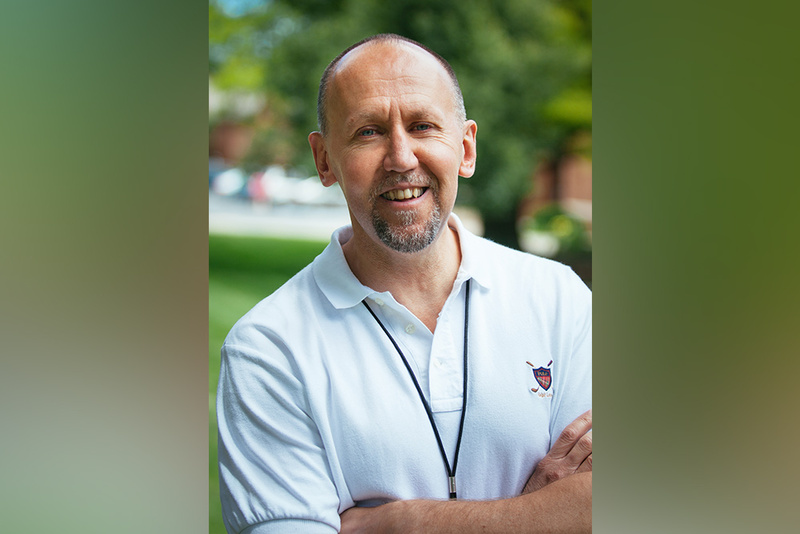 When Gregory Winship begins teaching a new course of conflict transformation training at a minimum-security prison in Missouri, he waits until the second session to share his past. “The first week, they’re telling me about how bad life is in prison and all the things they wish could be changed and all the hurt and harm that’s been done to them,” says Winship, who works for the Center for Conflict Resolution in Kansas City, Missouri. During the second session, he shares an optical illusion. Some participants see a frog, others a horse. The atmosphere changes, he says. The space is suddenly shared. He is not only a teacher but a companion. Those who see a frog now see a horse, and those who see a horse now see a frog. His lesson goal—“to help them see and perceive differently” — is fulfilled in a heartbeat. Winship is the most credible of “credible messengers” — someone who has done wrong, harmed others, learned, grown, changed and determined that his life, and his unexpected freedom, is only worth something if he devotes it to helping others. He works to help those on the inside and the outside transform their own perceptions of justice and form right relationships. To that indelible credibility, add this: Winship is the first graduate of Eastern Mennonite University’s MA in restorative justice program. The program of the Center for Justice and Peacebuilding is the first of its kind in North America. In Winship’s work and his research, he has begun to propose incremental but ground-breaking integration of restorative, rather than retributive, principles into the prison culture. 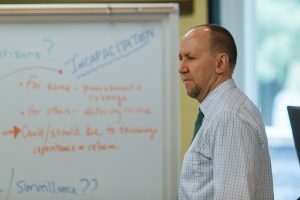 Howard Zehr, distinguished professor of restorative justice at EMU, became a mentor to Winship during his studies at EMU. Winship first read Zehr’s seminal Little Book of Restorative Justice while in prison; fourteen years later, on April 30, he sat among other graduates, listening to Zehr give the EMU commencement address. For both men, the moment was transcendent: Zehr, a seminal figure in the field of restorative justice, commended Winship, the first graduate in the university’s program – and fittingly, a man who embodies its redemptive principles and powers. Finding a purpose began almost immediately after Winship entered a maximum-security prison at age 29, with five consecutive life sentences ahead of him. At a time when prison education programs were better funded, Wilmington College (of Quaker origins) operated a branch campus inside the prison. Winship, who previously earned his degree in business administration from Graceland University in Iowa, became the program clerk, managing records of approximately 300 students using what was then new computer technology. 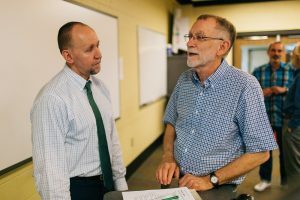 He trained in Laubach literacy techniques and tutored in the GED program, eventually creating and writing curriculum for a pre-college program that helped students bridge the skills gap between GED and college coursework. He is still asking that question, and making that bold statement years and years later. In the broadest sense, he is still saying: Can’t we do something more? These people are human beings who still have something to give back to society. Winship read about Zehr’s principles of restorative justice about 14 years into his prison sentence. The principles resonated immediately, he said. One reason for Winship’s connection was that restorative justice depends on building relationships through dialogue and communication — skills and processes that are limited, minimalized and discouraged in the prison environment. Ironically, Winship was handed the Little Book of Restorative Justice by a staff member. Such exchanges of material are “illegal,” he notes, with a wry smile. Those relationships changed his path: the staff member who loaned him the book; the Wilmington College professors who called him by name instead of by number; the staff members and volunteers who supported his involvement with a shelter rescue and therapy dog training program; the Awareness Retreat team members who gave spiritual support; and finally, an unexpected intercessor who approached the parole board. Criminal, felon, inmate, offender: “There is no nice name for what we are in our society,” Winship says. He knows what it means to be treated as less than human, the small indignities, the inconsistencies of authoritarian rule, how prison culture makes re-entry to the outside difficult and sometimes impossible. “The degree of civilization in a society can be judged by entering its prisons,” Winship quotes Russian writer Dostoevsky, who spent 10 years in prison and in work camps, who was standing in front of an armed firing squad when his pardon arrived, death averted suddenly, astonishingly. Sometimes the key to simple, slow change is one person in charge, one person who might see a horse where others see frogs. Bringing residents and staff together into a room where they together learn and explore skills of conflict resolution is potentially groundbreaking, culture-changing work. The rationale is clear: If residents can learn and practice conflict resolution skills, and staff can learn and practice conflict resolution skills, imagine the benefits to both parties, to the prison itself, and to the wider community. Would prisons be more rehabilitative environments if the relationships were collaborative instead of combative? If residents were treated as vessels of hope and healing instead of “an object or something we don’t want to know anymore”? He presented this theory of change to professors and classmates at EMU just a few weeks ago. When he finished, Zehr came up and proposed a retreat of formerly incarcerated individuals. To work together towards the creation of a fully restorative system or approach, Zehr encourages dialogue among many and varied voices. Such deep listening and collaboration with others has been an important and creative contributor to his own work. Such meetings, known as “palavers,” are where those voices can be heard in a process that creates a path towards a shared vision. For Winship, this convergence had real possibilities: for years, he had thought about starting a national organization of formerly incarcerated individuals to be mentors of the restorative process to those impacted and harmed through the criminal justice system. This organization would also work to change the public image of returning citizens and to influence policy-makers. He is not proud of why he spent 20 years in prison or the hurt he caused so many people. He’d like to change that part of his past. But he can’t and so he’s working at making that right, slowly, one day and one relationship at a time. He owns his choices, then and now. Greg is doing great work. I knew him from our Awareness retreats at ACI in Lima, Ohio. He was very involved with the prison at that time and was a very intelligent, compassionate, and impressive inmate ( also exceptionally talented musically). He has a lot to offer people in this field. His work is desperately needed in prisons today and also with inmates who have left the prison system unprepared for life. My prayers are with you, Greg. God Bless you and your new career!! This inspiring story brought tears to my eyes. Thank you for telling it, EMU, and congratulations to Mr. Winship for earning his MA in Restorative Justice. 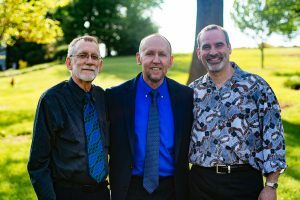 It is wonderful to see that this program, through the continuing efforts and commitments of Howard Zehr, Carl Stauffer, and many others, has taken root and is now bearing beautiful fruit. This story made me hopeful for more Restorative Justice practices in the prison where I volunteer. I long to see the retributive focus become a restorative focus. I see such potential in many of the women I meet but very little opportunity for expression. At least not yet. Thank you for this article of an inspirational story of hope, community, support, responsibility, inclusivity, learning and sharing. It buoys the work we are doing with our “Towards a Restorative City” vision in Whanganui, New Zealand. We’d love you to come for a visit!